HHistorically, the Tessen fan played a significant role in both Japanese etiquette and as a deadly weapon. Tessan means literally ‘Iron Fan’, constructed as a folding fan with up to ten metal ribs. It was used as a weapon to complement the sword and many high ranking samurai carried one at all times, primarily for self defence rather than aggressive strikes. 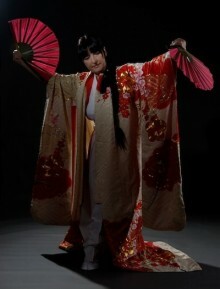 It was used for maiohgi-gata, a style of traditional Japanese dancing and in Kabuki. Here we see Fay performing this graceful tessan art to her own highly acclaimed music from the album Kokoro (Spirit of the Heart).